Find out about all of our job training, donations, and sale events. Thanks to our shoppers and donors, Goodwill of the Olympics and Rainier region kept 86 million pounds of household goods out of the landfill in 2017. The infographic takes you through the life cycle of your donation – from the initial donation to creating job training programs and putting people back to work. Goodwill strives to generate the most revenue from your donations by distributing your items across a variety of retail venues – an online store for high end, unique and vintage donations, boutiques for top name and designer apparel brands and home decor, and main retail stores for every-day clothes, furnishings, electronics, kitchenware, toys, books, decor and more. What doesn’t sell at these venues eventually ends up at our outlet stores where goods are given one last chance to sell by the pound. Our outlet locations double as recycling facilities where our teams sort, bundle and distribute the unsold goods. We are able to recycle nearly everything we collect; paper for pulp, clothing for rags, glass for counter tops – even metal, electrical cords and light strings. We also work with local recycling programs to help keep waste out of landfills. Textiles are also sold on the international market and can also provide funding for programs too. Goodwill has partnered with E-Cycle Washington to recycle most unsold or non-working electronics. E-Cycle Washington is a free program that makes it easy for Washington residents to recycle their broken, obsolete or worn-out electronics. Electronic products contain valuable materials that can be recycled and toxic chemicals that should be kept out of the landfill. 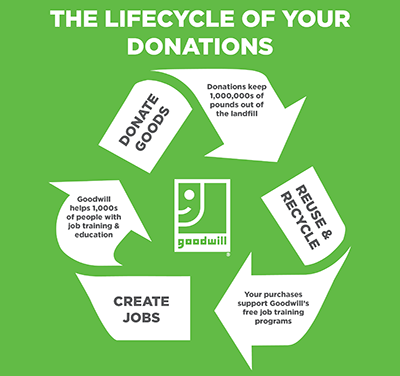 What can I recycle FREE at Goodwill? We are not able to accept printers, keyboards, toner cartridges or cell phones at this time. Torn or stained apparel, linens, single shoes, gloves and socks were once considered garbage. Goodwill accepts ALL textile donations, in any condition (except wet or contaminated with hazardous materials) so they can be re-used or recycled into new products. So now when you drop off your donations to Goodwill, include those mismatched socks, old, tired sheets and worn shoes, because you are doing your part to keep unnecessary waste out of the landfill.